The 120-foot-tall Big Bat is the world’s tallest and an exact replica of Babe Ruth’s 34-inch Louisville Slugger. 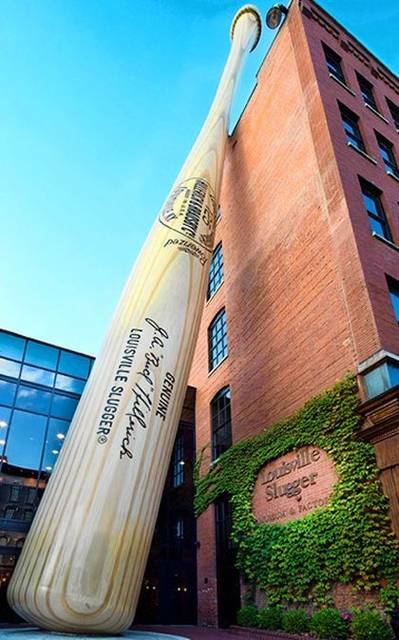 The Louisville Slugger Museum and Factory Tour is one of the best sports museums in the world, according to Forbes.com. Visitors can have personalized baseballs made during the factory tour. “And they’re off” and you should be too for a fun weekend getaway to Louisville. There are an unbridled number of tourist attractions and activities in the city. Whatever you call it, Louisville has great food, great hotels, world class horse racing, relaxing riverboats, fine museums, great concerts and plenty of baseball, just 3 1/2 hours from the Urbana area. What more could you ask for when looking for a place to get away for the weekend? Venture down to Louisville and you will quickly find out that this southern hospitality city is not just the “gateway to the south” but a great place down south to take the family for a weekend mini-vacation. There is so much to explore and discover in this fast growing modern city that it is difficult to decide where to start. Famous for its horse racing, Churchill Downs is a must stop. 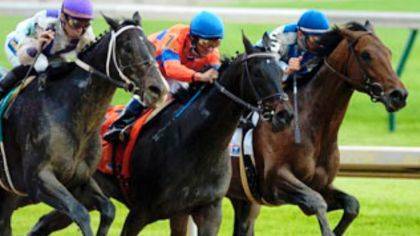 Watch the ponies race at the track where the world famous Kentucky Derby is run every year. Be sure to visit the Kentucky Derby Museum and the all encompassing “track tour” while you are there. Now if watching fast race horses is not your thing, try riding a fast roller coaster. Kentucky Kingdom amusement park features many great roller coasters and also has a huge waterpark called Hurricane Bay which has with many fun water rides and slides. Louisville is not only known for fast horses and slow boats but also for its smooth bourbon. Visit the many bourbon shops and bourbon experiences in downtown Louisville’s “Bourbon District” – also known as the “Urban Bourbon Trail.” Venture out even further on the famous “Kentucky Bourbon Trail” which offers extensive tours of the many world famous distilleries such as Jim Beam and Makers Mark. For those who enjoy the theater, Louisville has its own ballet, orchestra, regional repertory theater, children’s theater, opera, dinner theaters and many other niche theater venues throughout Metro-Louisville. Louisville also has many great museums to choose from including The Louisville Slugger Bat Museum and Factory, Muhammad Ali Center, the Speed Art Museum, KY Derby Museum, Ky Science Center, Howard Steamboat Museum and the Ky Museum of Arts & Craft. Sports fans should visit Slugger Field, home of the Louisville Bats, Louisville’s Triple A baseball team. Check out Papa John’s Football Stadium where the Louisville Cardinals play and the incredible Yum Center, which is home to the University of Louisville basketball team and also a top national venue for major concerts and entertainment events. Great restaurants, shopping and golf are also part of what makes Louisville a memorable weekend destination. There are five major shopping malls in the Louisville metro surrounding area. There are numerous great places to eat in Louisville. Be sure to visit Mike Linnigs Restaurant on the riverfront in southwest Jefferson County, and Kingfish Restaurant on the waterfront on southern Indiana. Louisville also has its own Hard Rock Café. If you stay the weekend, Louisville has many first class hotel accommodations including a 30-story 612-room Omni Hotel, a Hyatt, multiple Hiltons, a 4-Diamond Marriott, an Embassy Suites, and its famous list of local first-class hotels including the Galt House, Seelback and Brown Hotel. For the golfing enthusiast, Louisville offers first class public and private golf courses. Valhalla, the premier golf course in the area has been host to the Senior PGA Championship and Ryder Cup Championship. If you like the outdoors Louisville has plenty to offer. Be sure to check out the $2.5 million Louisville Extreme Park located in downtown Louisville. The park is open to boarders, bikers and bladders 24 hours a day and admission is free. Be sure to also check out both the incredible new Parklands of Floyd’s Fork Park (a 27 mile, 21st Century Park) and the Louisville Loop, a 100 bike trail. Louisville also has its own forest located within the city limits. Jefferson Forest is the largest municipal urban forest in America, with many miles of rugged, challenging trails and beautiful vista views of downtown Louisville. Just north of Louisville is Huber Farms and Winery. The kids will love the petting zoo, pony rides and corn maze. Mom and Dad will enjoy the farmers market, gift shops, winery and cheese factory tours. A little known destination to visit east of Louisville is a place called Henry’s Ark. Walk among the exotic animals at this unique farm/zoo in Prospect Kentucky. Encounter giraffes, antelope many different rare birds. Walk with baby camels, goats and other animal friends at this eccentric farm. Other great places to visit and explore in and around Louisville are the famous Mega Caverns Tours, the Louisville Stoneware Company, Marengo Cave, Squire Boone Caverns, Bernheim Arboretum and Research Forest, the Louisville Waterfront Park, Fourth Street Live, My Old Kentucky Dinner Train, Glassworks, the Forest Discovery Center, and Caesars-the largest floating casino in the world. Additional adventures you don’t want to miss while in Louisville are the Gorilla Forest at the Louisville Zoo, the 120 foot baseball bat at the Slugger Museum and the Falls of Ohio State park and Museum. As you can see, Louisville is jammed packed full of adventure and family fun attractions and well worth the short drive, however you may pronounce it. https://www.burgtelegram.com/wp-content/uploads/sites/17/2018/06/web1_BatWeb.jpgThe 120-foot-tall Big Bat is the world’s tallest and an exact replica of Babe Ruth’s 34-inch Louisville Slugger. The Louisville Slugger Museum and Factory Tour is one of the best sports museums in the world, according to Forbes.com. Visitors can have personalized baseballs made during the factory tour. https://www.burgtelegram.com/wp-content/uploads/sites/17/2018/06/web1_RaceWeb.jpg“And they’re off” and you should be too for a fun weekend getaway to Louisville. There are an unbridled number of tourist attractions and activities in the city.